I was wrong and admit it, I fitted the battery maintenance charger to my Bike, and then found out it was for 220v only, I thought as I was connected to a lower voltage, it would just take longer to charge. It just goes to show that ignorance doesn't always overcome adversity. I looked it up on the internet after posting about it, and found that at best it wouldn't charge, at worst it could damage the battery, I'm not sure if I have done the latter, but this morning I was going to go down town, and found the battery flat as a fluke! I used my car battery charger/starter, and fired up the bike, but the battery wasn't taking an instant charge, so I put it on trickle charge and left it. However, after my online discovery, I ordered a new bike charger, and it arrived today, so I will fit that tomorrow. Whilst messing with the bike, I saw something lying in the middle of the parking area, and found one of my footpegs. 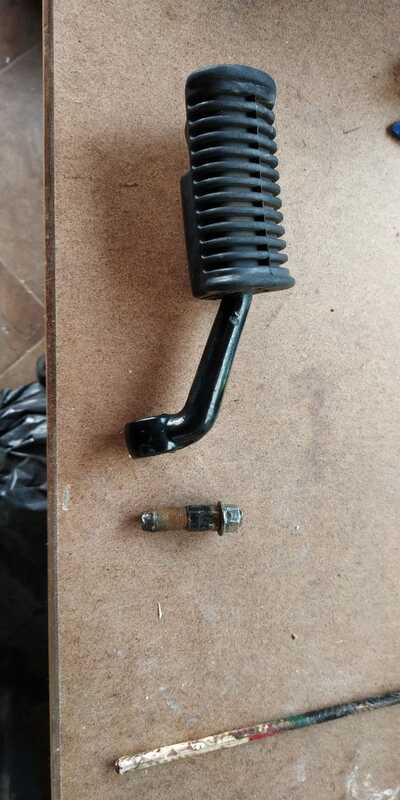 I knew that the previous Owner had dropped the bike at some point, because there is a minor dent in the front of the fuel tank, but he had obviously broken the foot peg bolt as well, and just hammered it back in the hole, with the vibration it had come loose and dropped out. 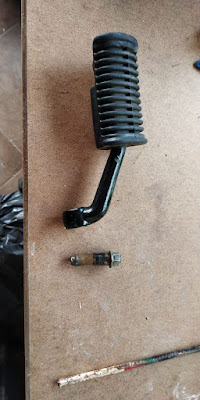 Thank goodness it happened at home and not out on the Motorway, so in the morning I will go down town and see if I can find a replacement bolt, otherwise it will mean a trip to Medellin to the RE Service Center. It does make you wonder what other surprises I have in store over the coming months. It has been a long day today, I woke at 3am, I have no idea why, and then Marcela had to be up at 4.30am to take her Father for a series of Specialist appointments starting at 7am on the other side of the City, so I saw them off, showered, and took the boys for their morning walk. To be honest, it was probably just as well, I didn't head off on the bike. I spent the morning preparing the second guest bedroom, for the Mother-in-law, it was more of a furniture moving exercise, because we keep the freezer, and other bits in there, they had to be moved out, the room cleaned, bed made. I am getting really good at the Domestic chores lark! Having been out all morning, Marcela then had to go and work in the shop, normally she doesn't close until 8pm, but at 6.30pm, I received a call to say they were half way between the Motorway, and home, which usually gives me five minutes, before she is at the gate, she's obviously getting the hang of the Montero, because it didn't take that long!